SAUDI Arabia and the United Arab Emirates have bought 110,095 tonnes, or 96 per cent, of the 114,643t of feed barley Australia exported in November, according to the latest data from the Australian Bureau of Statistics (ABS). The November feed figure marks the start of current-crop barley shipments from Australia, and China is notable in its absence, with no purchases of Australian coarse grains showing up in the data. 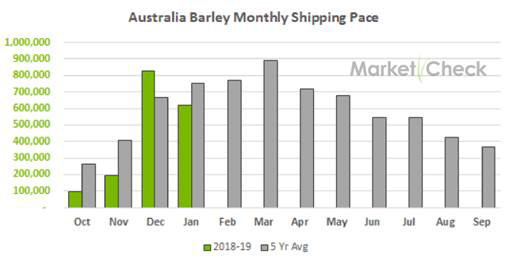 This is in stark contrast to the front shipping months for Australia’s old-crop feed barley, when China was regularly buying more than 200,000t of barley each month until its demand faded in July. Market Check head of strategy Nick Crundall said the historically low number for November shipments was no surprise, as drought had wiped the eastern states’ export surplus, and Western Australia, Australia’s key current-crop exporter, was only around 60pc through its harvest. “Compounding this was the very little old-crop left over from the 2017-18 season that could have been exported in November,” Mr Crundall said. Mr Crundall said Australian exporters and Chinese importers were pushing to have existing sales executed as soon as possible, and booking nearby sales, to finalise paperwork before any tariff or deposit structure is potentially implemented ahead of China’s anti-dumping investigation into Australian barley. “This also explains the big December loadings, and January is shaping up to be a strong export month. Mr Crundall said also worth keeping in mind when comparing Australian exports was that national production was 15-20pc smaller than the five-year average. While China has been a high-volume buyer of Australian feed barley in recent years, Saudi Arabia has been a major customer for shipments for decades. In malting exports, November volume was in line with September and October shipments, and this has pace is expected to continue into February, when grain recently harvested while have finished its dormancy period, and will be ready to malt on arrival to its overseas customer. New-crop Australian sorghum exports are looking unlikely unless Central Queensland gets substantial planting rain in coming weeks. This is because any tonnage produced in southern Queensland and northern New South Wales is likely to be snapped up by the domestic stockfeed industry for use in poultry, pig and cattle rations. Table 1: ABS Australian feed barley exports for September, October and November 2018. Table 2: ABS Australian malting barley exports for September, October and November 2018. Table 3: ABS Australian sorghum exports for September, October and November 2018. Your comment will not appear until it has been moderated. Contributions that contravene our Comments Policy will not be published. © 2019 Nascon Media Pty Ltd.